You Can Taste All The Love Deb Berry of Deb's Cookie Jar Puts into Her Cookie, Muffins and Other Tasty Treats She Serves. She's Put in a Lot of Hard Work as well! See there all new lunch menu below and in gallery of photos! By the time customers are lined up at 8am to get some of Deb's tasty cookies and other delicious treats she serves, Deb Berry has already been up for hours mixing dough and baking her cookies and muffins and all the other things customers don't see getting the store's doors ready to open. What customers do see is Deb with her smile from ear to ear as she serves up cookies, coffee, or breakfast with a beautiful aroma of fresh baked cookies filling up the store. Besides having a large choice of cookies, around 20, you can find wonderful muffins, or a small, but nice, choice of breakfasts that you can eat there or take to go along with a delicious cup of coffee. My favorite cookie is the Macadamia Chocolate Chip but they all are great. I usually end up coming in for a late breakfast of Biscuits and Gravy with scrambled eggs and bacon. Deb, her sister Sharon and Melanie, who work there with her, are all great. If they have it available, they will cook it up for you. 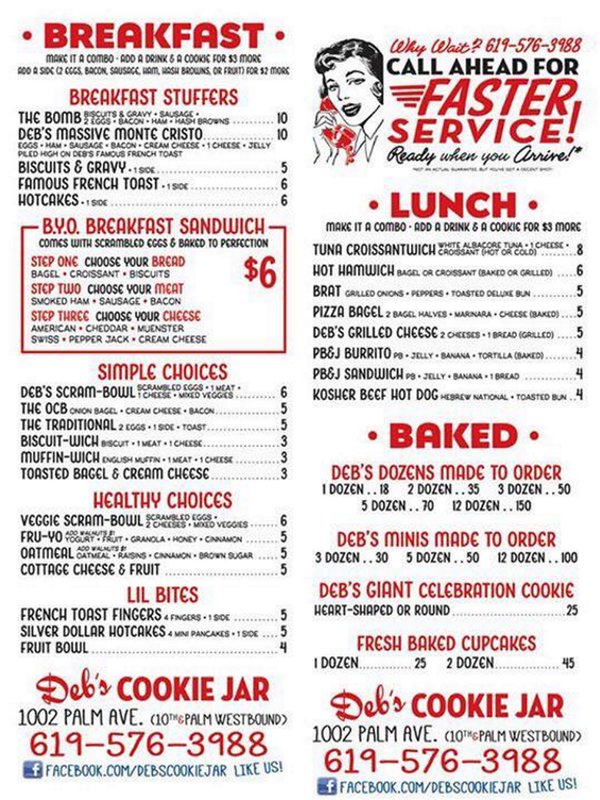 Up till now, Deb's Cookie Jar, has only served breakfast besides her delicious cookies and muffins. However, after the 4th of July they plan to introduce a lunch menu for the crowd that comes in later in the day. Whatever you have at Deb's Cookie Jar it will be a tasty treat for your senses. So, the next time your sweet tooth is looking to be satisfied or you have a party of special occasion and want to treat your guests to something special, be sure to stop by Deb's Cookie Jar. You'll be glad you did. And, please tell them Paul sent you!